WE WERE staring at an underwater Garden of Eden. And although man-made, only Mother Nature could take the credit for the mesmerising array of colours. The forest of timber piles was cloaked in a rainbow of “flowers” – corals and sponges reaching for the sky, swaying endlessly with the current, and appearing to fight each other for our attention. Calling this paradise home were schools of herring, while trevally and samsonfish were plentiful, too, though the octopus was playing hide and seek. Now and again, a translucent jelly plume – like a miniature jellyfish – would pulse by without a care, like a feather in the breeze. We were 8m below the surface but for this peek into what lies beneath, we were high and dry. In fact, we were standing in air-conditioned comfort on the lowest level of the Under Water Observatory (UWO) near the end of the Busselton Jetty, two hours drive south of Perth, at the gateway to the Margaret River region. After a two-year closure, the jetty, which has undergone a $27 million restoration program, was putting on its brightest face for us. 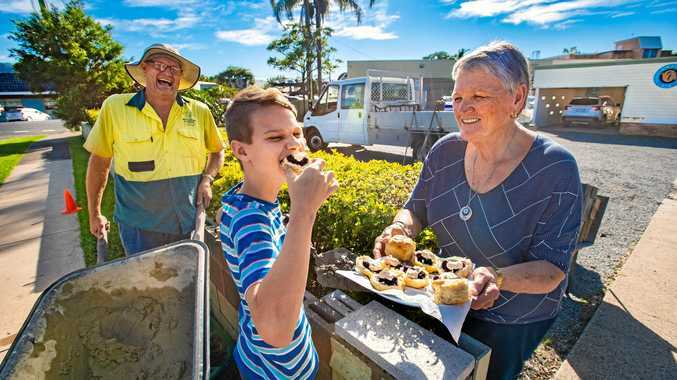 Only two days earlier, the massive structure had officially reopened with a gala community event, featuring top Aussie talent Kate Ceberano and one of the biggest fireworks displays the region had ever seen. 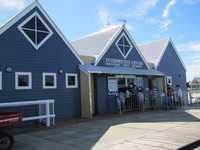 This day, the pretty white and boatshed-blue interpretive centre, with its four large gables, was bustling with people buying jetty and UWO tickets, browsing the souvenirs, homewares and gifts (some using recycled timber salvaged from the old jetty), and taking in the written and pictorial history in the signs and audio visual displays of the Cultural Heritage Museum. 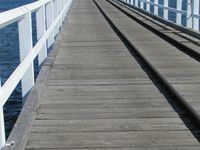 The interpretive centre, which opened in 2001, was designed in the style of the bathing sheds which graced the beachfront in the 1930s, and takes pride of place at the entrance to the longest timber piled jetty in the southern hemisphere. The perfect Monday morning had brought locals and visitors out in droves for a stroll over the boards. Some were on a mission to throw a line in. Many paused for a holiday snap. But we were stepping out more than 1700 metres, to join a morning UWO tour for a glimpse of this unique window on the ocean – one of Western Australia’s most popular eco-tourism attractions. 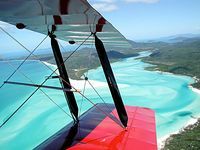 A 20-minute walk over the calm and clear teal green and deep blue waters of Geographe Bay to the UWO allows you to fill your lungs with the fresh salt air and marvel at the engineering feat of jarrah pine driven into limestone bedrock that had produced this enduring tourist attraction. The popular train, which operates on tracks up the middle of the jetty, is an option for those wanting to take it easy. Our tour group is quickly marshalled in the UWO shop and introduced to our guide Kerry. Over the course of 40 minutes and 60 stairs, we progress down each level and across 11 viewing windows to a metre off the ocean floor. We discover each of the levels offers its own intriguing story of wave action and thriving marine life. On the upper level, we learn that the jetty’s piles and decking attracts sea creatures not normally found so close to shore, such as the round-face batfish, while also offering protection from the sun. a latitude of 33 degrees south, the jetty’s amazing coral growth and incredibly diverse array of tropical and sub-tropical species is due to the Leeuwin Current, which brings warm water down the Western Australian coastline each year during autumn and winter. Marine biologists have recorded more than 300 species in the ocean beneath the jetty, which has been applauded as Australia’s greatest artificial reef. Kerry, a diver, said she could easily spend half-an-hour looking at a single pile. On rare occasions, a stray sea lion from the nearby colony at Cape Naturaliste will venture towards the jetty, creating a photo opportunity for those lucky enough to be in the right place at the right time. Construction of the jetty began in 1865 and the 1841m structure took 95 years to reach its final length. In the beginning, it was used to ship timber products. Horse-drawn trucks were used for loading until 1911 when the railway jetty took over. After more than 100 years as a working port, operations stopped in 1972. The closure also meant maintenance ceased and the jetty deteriorated with the help of wood borers, rot and the occasional fire. Over the years, the jetty has stood its ground against the elements. But on April 4, 1978, Cyclone Alby took its toll and demolition almost became a reality. 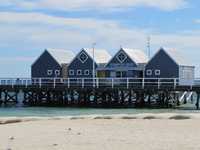 But the dedicated Busselton townsfolk began fundraising to ensure the jetty would be preserved for future generations. A public meeting in 1976 mooted the idea of showcasing the unique ecosystem under the jetty but the project only really gathered momentum in the late 1990s when the Busselton Jetty Environment and Conservation Association sought and received funding to build the $3.6million complex. 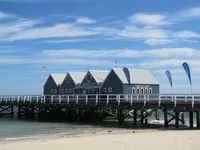 Busselton Jetty now attracts almost 400,000 visitors each year. Judging by the long line of tribute plaques gracing the middle section, the jetty has been a much-loved fixture in the lives of those who have spent countless hours and collected many happy memories over the years. No doubt the 90m extension to the jetty later this year to bring it to its original length of 1.8km will be needed to display many more tribute plaques in coming decades. The writer was a guest of Busselton Jetty and the Augusta Margaret River Tourism Association. Under Water Observatory (40 min guided tour) and return train ride: $28 adult, $14 children (3-14yrs). Jetty train ride only: $10 adult, $5 children (3-14yrs). 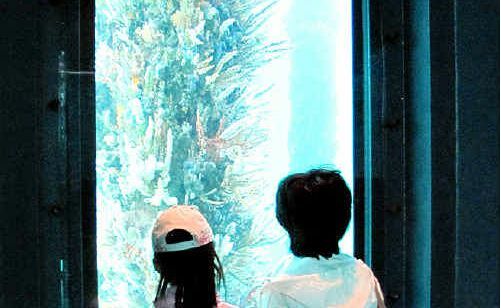 Full experience family package (includes observatory guided tour and jetty train ride): $75 for two adults and two children (3-14yrs); $5 per extra child. Bookings are essential for Underwater Observatory Tours. Phone (08) 9754 0900 (weather permitting). Admission is free to the Interpretive Centre and Cultural Heritage Museum (open every day except Christmas Day). All attractions, including the UWO, are wheelchair friendly.